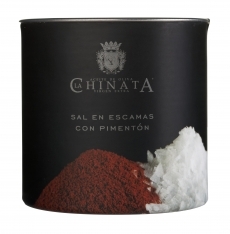 Sea salt flakes seasoned with chilli, from La Chinata. It's a surprising flavor, but an appetising one. Unlike table salt, sea salt carries no additional health risks, because it's so rich in minerals and trace elements. 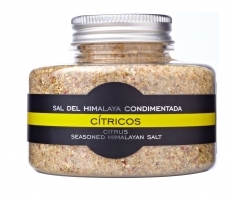 Additionally, because of its high mineral content, less is required to achieve the same flavor, so it can be used in smaller quantities than common salt. The flakes are fragile crystals that can easily be flaked between the fingers, and it dissolves extremely quickly. 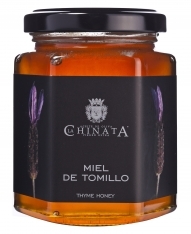 Because of this it's recommended to season finished food just prior to serving, so your guests can enjoy it to its fullest. It's especially well suited to flavoring meat dishes. 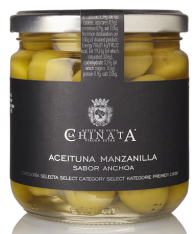 The Spanish name for this is "
Sal Marina en escamas chilli La Chinata."